Each pad starts with 5mm foam on the bottom for comfort and shock absorption. A thermo embossed, 3mm layer is then added to the top for durability and superior non-skid performance in both wet and dry conditions. Next the marine grade PSA backing is added to the pad. Next our CNC machine routes a finished bevel along the outer edge of the pad. Finally a logo is routed into the center of the pad. 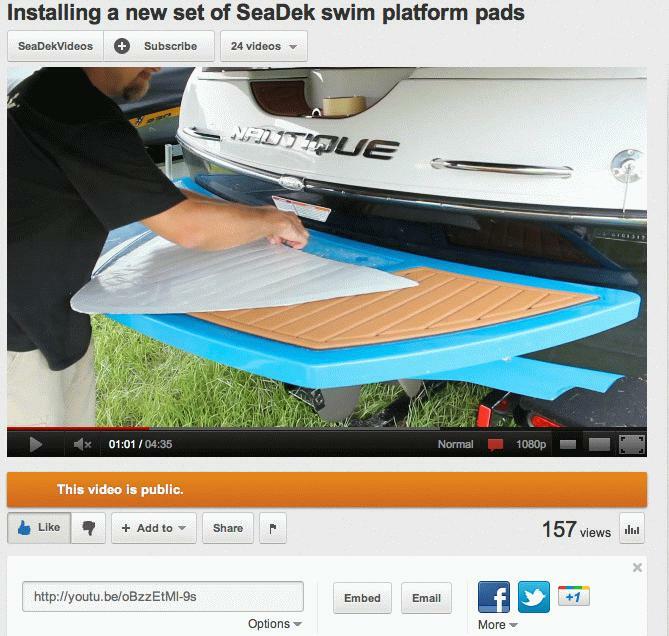 On stock items the SeaDek or boat manufacture's logo is routed into the pad. Custom text and graphics can be incorporated into the pad as well. Malibu®, Monterey®, Moomba®, Supra®, Yamaha®, Chaparral®, MaterCraft®, Tige® and Sea Ray® are just a few of the brands in our catalog of swim platform pad designs and our selection is growing daily. If you don't see your specific boat and platform don't worry, we will work with you to template your own boat using the template kits available from our online store. This short video will show you how to template you boat: Template Video.